Jay Williams was appointed by President Obama to serve as the Assistant Secretary of Commerce for Economic Development and was sworn into office on Tuesday, May 20, 2014. As the Administrator of the U.S. Department of Commerce’s Economic Development Administration (EDA), Williams is charged with leading the federal economic development agenda by promoting innovation and competitiveness, preparing American regions for growth and success in the global economy. Prior to joining the Department of Commerce, Jay served as the executive director of the Office of Recovery for Auto Communities and Workers. In this capacity, he worked directly with state and local stakeholders in areas affected by the changing American automotive industry to deliver federal support to ensure they returned to better economic condition. He also served in the White House as Deputy Director for the White House Office of Intergovernmental Affairs. In this position, he led efforts to engage mayors, city council members, and county officials around the country. Williams served as the Mayor of Youngstown, Ohio from 2006 to August 1, 2011. During his tenure as Mayor of Youngstown, Williams led efforts that had a direct impact on improving the quality of life for the citizens of Youngstown. Williams is the recipient of the 2007 John F. Kennedy New Frontier Award. The JFK Library Foundation, in conjunction with the Harvard University Institute of Politics, annually recognizes two exceptional young Americans- under the age of 40, whose contributions in elective office, community service or advocacy demonstrate the impact and value of public service in the spirit of President John F. Kennedy. Prior to being elected, Williams spent five years as the Director of Community Development for the city. Before transitioning into public service, Williams enjoyed a distinguished career in banking, which included stints at the Federal Reserve Bank of Cleveland and First Place Bank, as a vice president. 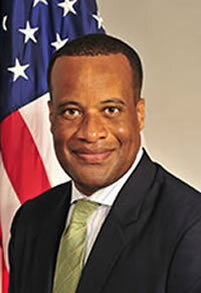 Assistant Secretary Williams was born and raised in Youngstown. He graduated from Youngstown State University with a B.S.B.A., majoring in finance. 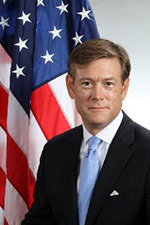 Matt S. Erskine was appointed by President Obama to serve as the Deputy Assistant Secretary of Commerce for Economic Development and Chief Operating Officer of the Economic Development Administration in September 2011. Mr. Erskine brings more than 20 years of leadership and management experience in business, public sector, and public-private partnerships. Prior to joining the Obama Administration and the Department of Commerce, he led the private-public partnership driving economic development and foreign direct investment for the 5th largest metropolitan region in the U.S. and worked in senior roles at global business consulting firms. Mr. Erskine also served as the Deputy Secretary of Commerce and Trade in Virginia Governor Mark Warner’s Administration, where he led multiple innovative economic development initiatives, had oversight of 16 departments and agencies, and was a member of the management team responsible for Virginia's designation as the nation's best-managed state. Mr. Erskine received special recognition from the International Economic Development Council (IEDC) in 2014 for leadership in and service to the economic development profession. Mr. Erskine earned a Bachelor of Arts (B.A.) from the University of Virginia as an Echols Scholar and a Master of Business Administration (M.B.A.) from the Harvard Business School. He competes in ultra-distance races, marathons, and triathlons. Erskine and his wife have three children. 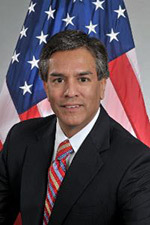 Thomas Guevara serves as Deputy Assistant Secretary for Regional Affairs, directing and supervising the activities of the Economic Development Administration's (EDA) Office of Regional Affairs, which includes all six EDA Regional Offices, the Performance and National Programs Division, EDA’s Loan Guarantee Program, the Integrated Economic Development team, and EDA’s Organizational Development team. He also is the Grants Officer for the agency’s Regional Innovation Strategies program, which awards grants to state, local, non-profit and tribal organizations to create and sustain regional systems of innovation, entrepreneurship and venture capital development. EDA's Regional and Headquarter Offices are responsible for program delivery of investments that fulfill the agency's mission of leading the federal economic development agenda by promoting competitiveness and preparing American regions for growth and success in the worldwide economy. Mr. Guevara brings over 27 years of management experience in financial advisory services, public-private partnership finance, and economic development program management and consulting. Prior to joining EDA, Mr. Guevara served as a Director at Crowe Horwath LLP in Indiana, where he managed financial advisory services for over $1 billion in bond sales for public and public-private capital projects and delivered economic impact studies for projects totaling over $500 million. He previously worked for the state of Indiana as CIO of the largest state agency, where he was responsible for information technology projects and expenditures in excess of $140 million annually, serving over 8500 agency users statewide, and administered by over 250 employees and contractors. Mr. Guevara also served as Assistant State Budget Director at the Indiana State Budget Agency, where he headed the Health and Human Services division. Mr. Guevara's budget oversight responsibilities included over $3 billion in agency budgets, meeting the Governor's mandated spending reduction targets, negotiating budgets with agency heads and legislators, and implementing new spending plans.